How do I obtain a permit or easement reduction? The BLD approves levee permits and general permits necessary to cross a levee or other drainage structure within the district. The BLD also reviews requests for easement reductions in cases where it can be demonstrated that a reduction would not adversely impact the integrity of the drainage system within the district. Please see the “Permits and Easements” section of this website for specific application instructions. When flooding is forecasted, sand bags can be obtained from the City of Bossier City, the Bossier Parish Police Jury, and the BLD. Who is responsible for keeping undesirable trespass activity such as ATV riders off of levee or channel easements? The BLD does not own the property the levee or drainage channel is located on. The BLD only has a maintenance easement and can not direct who accesses the property as long as there are no damages being made to the levee or channel easement. However, Louisiana R.S. 38:213 does specifically prohibit riding or hauling on levees except where, in the judgment of the levee district, it will not damage the levee. Property owners should contact law enforcement authorities to have undesirable trespass activity ceased. Who do I contact to get the ditch or channel repaired or cleaned? There are three (3) separate agencies in Bossier Parish which have maintenance responsibilities for various ditches and channels: the BLD, the City of Bossier City, and the Bossier Parish Police Jury. If you are unsure which agency is responsible for maintaining the ditch or channel you are concerned about, contact any of the three agencies and you will be directed to the responsible agency. How close can a pool or excavated pit be placed to the levee? Any excavation within 600 feet of the levee toe requires an evaluation by the USACE. Contact the BLD Office to request an evaluation. How close can an oil or gas recovery well or water well be placed to a levee? No oil or gas recovery well or water well can be placed closer than 250 feet from the landside levee toe or within 100 feet from the riverside levee toe. Anyone wishing to place a well within 1500 feet of a levee should contact the BLD and the USACE. What work near a levee or channel requires a permit? Any type of permanent structure or construction located on the levee or channel easement requires a permit; any work within 300 feet of a levee requires a letter of no objection from the U.S. Army Corps of Engineers (USACE); any excavation within 600 feet of the levee toe will require evaluation from the USACE; the BLD and the USACE must be notified of any subsurface work with 1500 feet of a levee and of any seismic work within 5000 feet of levee. All requests for permits or letters of no objection should first be forwarded to the BLD Office. 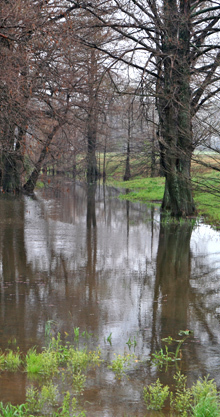 How do I know what the Bossier Levee District’s easement limits are on my property? Louisiana Revised Statute 38:113 established a 100 foot easement from the high bank of the channel for the channels which are under Bossier Levee District (BLD) control. 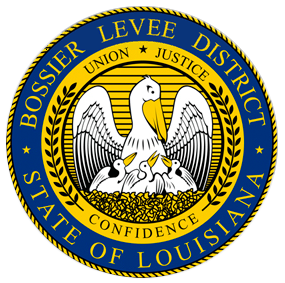 In some cases, the statutory easement has been reduced; if you are unsure of the limits of the Levee District’s easement on your property, contact the Bossier Levee District Office for specific information.